Portugal has a connection to the sea like almost no other European country. Its search for a new route to Asia and the many maritime voyages it took led to Portugal being one of the main contributors to the drawing if the world map. It's Atlantic coastline is over 800kms long so it was only a matter of time before someone saw its surf potential. Like most European countries surfing started when a local saw others doing it while travelling. The old story goes that Olympian António Jonet took a big wood surf board back with him from Hawaii. He took it out in Lisbon's surf beaches but ended up colliding with an old women and broke her leg and also the board. He never surfed again! Portugal was a dictatorship until the revolution in 1974 . It was at war with its colonies and wasn't the best place to travel to. It wasn't until after the revolution that surfing in Portugal began to take off. In 1977 Ribeira D'Ilhas in Ericeira held Portugal's first surfing contest. Surf brands and shapers started to emerge as did a new generation of surfers. A decade later the Portuguese Surfing Federation was formed and local and international competitions began to take place all over Portugal. In the last 10 years three major events have catapulted Portugal into the Surfing world. In 2009 the World Tour came to Peniche and has been there every year bringing the worlds best surfers together to compete. The second is the emergence of Tiago Pires as one of the best surfers in the world. The third has been the discovery of Nazaré as one of the biggest waves in the world. Footage of Hawaiian big wave surfer Garrett McNamara surfing the 80 foot wave was captured by every news organisation in the world and has guaranteed Portugal's status as one of the worlds best surfing destinations. What's the surf like in Portugal? Mention surfing holidays Portugal to anyone and they will become very jealous very quickly! The country is our most popular surf holiday destination and it is easy to see why. Surfing Portugal's coastline will take you to beautiful unspoilt white sandy beaches that you would never normally get to - all of which have direct access to the best waves and surf Europe has to offer. Mix this with the laid back surf culture, traditional unspoiled towns, inexpensive cost of things, delicious seafood, great coffee (and Pastal de Nata custard tarts!!) and of course the friendliest of people and you will never want to leave! Portugal's surfing mecca. 12 surf beaches in an 8km stretch make this one of the world's best surf areas. It has options for all levels, including the excellent beginners beach Foz do Liandro and the world class right Coxos. What makes this place so special is the charming old town and its cobblestone streets and also the friendliness of the locals. The beautiful old village sits on top of cliffs that look down on pumping waves below. The town suits all, whether its a family, couple or a surf camp Portugal type surfing holidays it ticks all the boxes. Ericeira is always among the top choices for surfing holidays Portugal. Stay once and you will never want to leave. 1 hours drive from Lisbon, Peniche is a peninsula that sticks out along Portugal's Atlantic coast. It faces South, East, West and North so it picks up every swell & a break with offshore wind can nearly always be found. As a result it is probably the most reliable surf area and home to some of the best surf camp Portugal options. It is also home to Portugal's most famous wave, Supertubos, and is host to the Rip Curl Pro, part of the WSL world tour, every October. The main surf beach is the long stretch in the area of Baleal, called Cantinho da Baia. It is one of Portugal's best learn to surf spots. Meaning West in English, this area covers the surrounding area north of Ericeira, either side of Peniche and on up to Aveiro. Often called the Silver Coast, the effect the evening sun gives the Ocean. It encompasses smaller towns some of which are a lot less crowded and have perfect empty surf. If you want to escape the crowds then these are the surf spots to go to. It includes Santa Cruz, Praia da Areia Branca, Figueira da Foz and the infamous Nazaré, a lovely beginners beach in the summer, and come winter produces one of the worlds most magnificent big waves. These 3 areas are all within 30 minutes of each other and each offer their own unique surfing holiday experience. They have the added advantage of being so close to Lisbon making them a great option for weekend surf holidays Portugal. Lisbon is the birthplace of Portuguese surfing. Surf beaches such as Caracavelos, Costa de Caprica and Guincho have held many major national and international competitions and have a great surf vibe. The 3 areas are full of historic Castles, Palaces & Old Mansions where old world mixes perfectly with new. The majority of waves are beach breaks, making it a great place to learn to surf in Portugal. There is always a wave to be had and a few high quality reefs such as Poca & Parade. The coastline from Sesimbra south of Lisbon down to the Algarve is the Alentejo coastline. The top part is a mix of open sandy surf beach breaks, in areas like Meldines, Carvalhal and Comporta, great year round surf and often empty, especially outside of summer. There is more a mix of bays, coves, and inlets further south giving a more of a variety. Alentejo is a bit further away from airports so the travelling surfers don't tend to venture here. The Portuguese often go straight to the Lisbon area or further south. All of this is good news, empty lineups for those who venture furthest! Towns like Vila Nova de Milfontes, Zambujeira do Mar and Odeceixe offer a real taste of what Portuguese rural life is like. Its off the beaten track, chilled out and has lots of mellow surf. Vilamoura is the starting point of surf in the Algarve, anywhere further East doesn't get as much swell for reliable surf. Vilamoura is a great beginners spot, in winter it can get good intermediate and advanced surf but it is further West that holds all the big thrills. Lagos has become one of Portugal's big surf towns, rivaling Ericeira & Peniche and has a great selection of accommodation and surfcamp Portugal options. There is not a great deal of surf breaks in the town itself but many use it as a base to surf Sagres & the Vincentina Coast. It's full of great restaurants, cafés, surf bars and their is always a party to be had. From here the main surf is 20 minutes away and includes the impressive Zavial & Beniche, fast barreling right and left handers. Beginners and Intermediates love it here and usually head to Amado, Amoeira and Arrifana, beautiful white beaches surrounded by cliffs and natural parkland without a high rise resort in site! 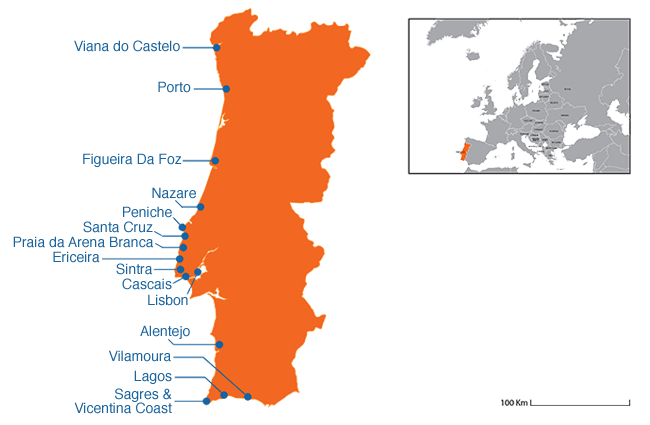 Portugal's second city sits at the very North of the country. The area is best known for its beach breaks, making it an excellent Portugal surfing destination in the summer months. The surf is a bit exposed in the winter so it is not as popular a choice that time of year. Matosinhos and International beach are perfect beginner/intermediate spots in Porto and have a lively surf vibe day and night. 20kms south of the city are Espinho and Esmoriz, small vibrant surf towns full of Portugal surf schools and surf shops. Casino in Espinho is one of the best barreling right handers in Portugal. It's a great part of the Portugal and it has becoming one of the most popular city break destinations in Europe. That's just a few of the main areas, there are many other surf spots in Portugal to explore, and of course there are the islands or Azores and Madeira too. Surfing Portugal southern coast, along the Algarve, means lovely warm 21°C water in the summer, dropping to only 15°C in Winter. This allows for Shorts & Bikini or just a shortie wetsuit for July, August & September. For the rest of the year you just need a light 3/2 suit. The area gets very little rain, expect 30°C in the summer and t-shirt winters with temperatures ranging from 15°C to 22°C. Central & Northern Portugal have amazing hot summers, 25°C to 32°C. It's hard to do anything but surf and sit on the beach!. The evenings can drop to 15°C because of the proximity to the coastline and the Atlantic breeze. Winter can get surprisingly cold, with not as much cloud cover the nights can drop to 8°C in December/January. Water temperature is 18°C in the summer and drops to 14°C in winter. Up North towards Porto is 1°C or 2°C lower. For a more detailed look at when & where to surf in Portugal for your surf level use our Surf Trip Finder. Then browse each destination to discover the best selection & lowest prices. We have a great choice of Portugal surf camps, self catering accommodation & surf lessons in Portugal's best surf towns. Book your surf holiday online now!